The architectural design, visual space, interior details and color palette in a home create a distinct feeling. Stunning details such as iron railings immediately capture your attention as you soak in the fine points of the entranceway and home interiors. Stone stairs leading to an entrance enhanced with iron railings or exquisitely designed wrought iron railing complementing a Juliet balcony creates a feeling of luxury before you enter the home. Match the style of an iron door or railing at your home’s entrance or create a focal point in your home’s exterior elevation with a distinctive balcony railing. Throughout the home, design details extend the aesthetic and sentiment established. Outdoor living areas such as a porch, deck or pool surrounded by iron railing exudes the essence of grace and style, while also providing security and an elegant boundary for the space. Iron railings inside a home complement traditional architectural designs as well as contemporary homes and create an open spacious atmosphere. Railings may be integrated in alcoves to separate a space or in a traditional front stairway to create a dramatic visual effect. An interior balcony elegantly connects rooms and passageways in a home. At Portella Iron Doors, we design stunning hand forged iron doors, iron railings and iron gates to suite every customer’s unique style. Durability and quality are cornerstones of our business and our railing products are industry rated for strength and stability. 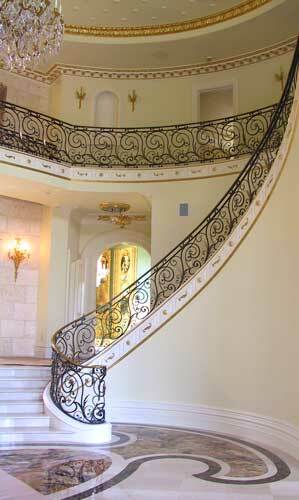 Iron railings may be manufactured to match any of our custom iron door designs. Choose from a variety of finishes e including meticulously hand finished shades of bronze, copper, gold, and silver – to complement your home’s front veneer, portico and walls.